Photo depicting flooding in the Woodland area in the spring of 1999. 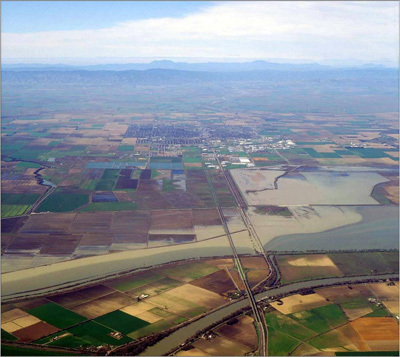 "Minimize the risk from flooding in western Yolo County while enhancing water supply, ecosystem integrity, recreation, and community values." The YCFC&WCD is taking a leadership role in the jointly-funded $600,000 effort. Program manager and water engineer, Fran Borcalli is overseeing the new division dedicated to flood and storm issues and flood control planning activities. In addition to working on flood control solutions, developing a sustainable funding mechanism is a priority so that the collaborative efforts for flood control management will continue after the 2-year pilot program ends. Yolo County, the City of Woodland and the District are pleased to present the first Annual Report for the floodSAFE Yolo Pilot Program. The floodSAFE Yolo Pilot Program is an effort to meet the challenge of protecting property during a flood event, while maintaining the benefits that flooding brings to our soils.